Red Crossbill are a medium-sized finch, which uses its crossed beak to pry open conifer cones. The Newfoundland subspecies, percna, are listed as endangered under both provincial and federal endangered species legislation. 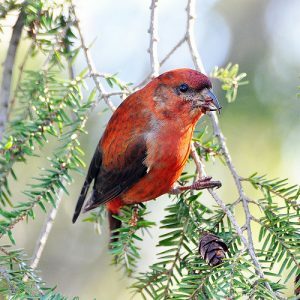 Red Crossbill are associated with conifer forests, with the highest numbers of observations occurring in the older, mature forests of western Newfoundland. The island of Newfoundland may be the only location where this rare subspecies breeds. Males are a dull red colour with brown shading and females are grayish olive with yellow rumps. They look very similar to White-winged Crossbills, but can be distinguished by the lack of white wing bars that White-winged Crossbills have. Many recent sightings in Newfoundland have been from bird feeders at houses and cabins throughout the Island. Please keep on the lookout for these colorful birds and report any sightings (along with photos and GPS coordinates, if possible)! Please pass along any sightings and photos to the Wildlife Division at endangeredspecies@gov.nl.ca or call 709 637-2025.